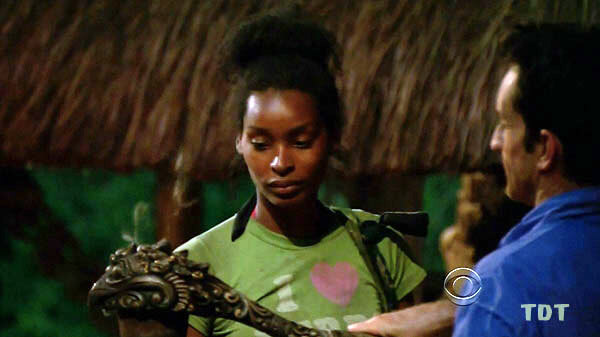 Survivor 28: Cagayan (2014) - 15th place, 4th out. Voted out in Episode 4, "Our Time to Shine" (Day 11). Cagayan Ep. 1 RC/IC: "Draggin' the Dragon" - Pushes the cart for Luzon, which finishes last (3rd/3). Cagayan Ep. 2 RC/IC: "Phish Farm" - Single-handedly blows a gigantic lead, as both opposing tribes easily pass her on the puzzle stage; Luzon finishes last (3rd/3). Cagayan Ep. 3 RC/IC: "Mazed and Confused" - Tosses water for Luzon, which manages second on the maze (2nd*/3). Cagayan Ep. 4 RC: "Haulin' Oats" - Raises (one side) of the platform for Luzon, which blows a lead on the final item and loses again (3rd/3). Cagayan Ep. 4 IC: "Octopus' Garden" - Curiously tasked with all the swimming jobs for Luzon, which surprisingly finishes dead last, despite Aparri's attempts to throw the challenge (3rd/3). Cagayan, Ep. 1: David Samson (voted out, 4-2). Cagayan, Ep. 2: Garrett Adelstein (voted out, 3-2). Cagayan, Ep. 1: Two votes, from David and Kass. Cagayan, Ep. 2: Two votes, from Spencer and Garrett. Cagayan, Ep. 4: Three votes, from Garrett, Kass, and Tasha (voted out, 3-1). Kass hurt my feelings by saying she'll vote against me! It's all on you, J'Tia, no pressure! They left the crazy person alone! With a camera crew! Oh, so Tasha is out of Garrett's alliance. Good to know. Luzon, trying to get through another challenge. I'm like the cat in those 'Hang in There' posters. Gordon Holmes at XfinityTV.com (3/13/14): "J'Tia: 'I Didn't Care If They Didn't Eat'"
Rob Cesternino at RHAP (3/13/14): "Talking With the Latest Player Voted Off Survivor: 3/13/14"
Steve Helling at People.com (3/16/14): "J'Tia Taylor: I Would Have Voted Me Out Too"
Daniel Fienberg at HitFix.com (3/16/14): "J'Tia Taylor talks Survivor: Cagayan"
"Personal Claim to Fame: Passing my dissertation defense, because I was the expert on the subject matter and held my own against my professors, and being the first black female to successfully defend and receive a PhD from the department. Inspiration in Life: My mother who is 61 years old and still kicking, running marathons, traveling, and learning new things. Hobbies: Watching movies, reading and playing strategic games. Pet Peeves: Ignorant, close-minded people, being late/off schedule, and chunks in food/drinks (e.g. rocky road ice cream). 3 Words to Describe You: Intelligent, adaptable and competitive. If You Could Have 3 Things on The Island What Would They Be and Why? My favorite “I Love Nerds” T-shirt, mint-flavored Mentos, and a really thick intricate novel that I could read repeatedly and find new meanings to. 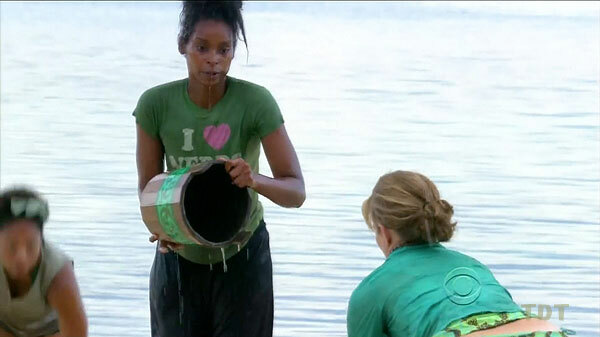 Survivor Contestant You Are Most Like: Richard Hatch. He played the game authentically and originally since he had no precedence, and was true to who he was. Reason for Being on Survivor: Winning a million dollars and beating everyone else, while on the adventure of a lifetime. Why You Think You’ll “Survive” Survivor: I’m very analytical so I’m good at breaking down/solving a problem and I’m also really good at getting people motivated and helping them achieve a goal. Why You Think You Will Be the Sole Survivor: I have an irrepressible drive and tenacity. Do You Consider Yourself a Brain, a Beauty or a Brawn? I'm definitely easy on the eyes but I'm a true Brain at heart. I would say I'm 1/4 Beauty, 3/4 Brain. My answer, in which I give myself a narcissistic compliment and then use fractions, pretty much confirms this. Who Do You Think Has the Best Chance in the Game of Survivor: Brains, Beauty or Brawn? Brains always win... 'Strength does not come from physical capacity. It comes from an indomitable will.' -Ghandi"